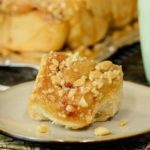 A recipe for cherry almond sweet rolls. They are filled with cherry preserves and chopped almonds plus have a sticky brown sugar and almond topping. Combine brown sugar, butter, and corn syrup in a small saucepan. Heat and stir until blended. Spread in the bottom of an ungreased 13- X 9- X 2-inch baking pan. Sprinkle chopped almonds on top. Whisk together 1 1/2 cups flour, yeast, sugar, and salt in the bowl of a stand mixer. Heat milk, water, and shortening in a small saucepan until warm (120 to 130 degrees F). Shortening does not have to melt. Add to flour mixture along with the egg. Using the flat beater, mix on low speed until moistened. Increase speed to medium and mix for 3 minutes. Add preserves and mix or stir to combine. Change flat beater to dough hook. Turn mixer on low (setting 1 or 2 as recommended by manufacturer when using dough hook). Gradually add enough remaining flour to make a soft dough. Knead for 3 to 4 minutes. Turn dough out on a lightly floured surface. Knead a few times and shape into a ball. Place dough in the greased bowl and turn to coat dough. Cover and let rise in a warm draft-free place until double, about 1 hour. Punch down dough. On a lightly floured surface, roll out dough to an 18- X 9-inch rectangle. Spread butter and preserves over rolled-out dough. Sprinkle brown sugar and almonds over dough. Starting with the longer side, roll up dough tightly. Pinch to seal edge. Cut into 18 slices. Place slices on topping in pan. Cover and let rise in a warm, draft-free place until double, about 45 minutes. Preheat the oven to 350 degrees F while the rolls are rising. Bake for 25 to 30 minutes, until golden brown. Cover pan with aluminum foil and invert on wire rack. Cool for 1 minute then remove pan. Cool rolls completely.